The Gay Men’s Chorus of Washington, DC has sent its small ensemble, Potomac Fever, on a US State Department sponsored diplomacy tour to promote LGBTQ rights in Ukraine. This tour came about due to the success of our Cuba concert tour last summer. Earlier this year, the US Embassy in Ukraine called us up and said they loved what we did in Cuba, and would like us to bring that kind of diplomacy to Ukraine – a country that is deeply in need of unity on LGBTQ and other issues. I am beginning this travelogue from the Kiev airport. Notably, the capital of Ukraine is pronounced KEEV by Ukrainians and KI-EV by Russians. No doubt this is one of many cultural distinctions we will encounter for the next week here. We are approaching our 20th hour of travel to get to Ukraine, so I'm writing this a bit bleary-eyed. Before we even boarded the plane, we had learned that the Ukrainian political activist and captive in Russian prison, Nadia Savchenko, was just released back to Ukraine after two years. The “Joan of Ark” of Ukraine has been a symbol of national unity and anti-Russia sentiment since her capture. This impressed upon us the seriousness with which human rights and freedom are part of the dialogue in the country we’re about to visit. Our first travel stop was Munich, an airport apocalyptically empty and sparkling clean in the morning hours. It also seems big enough to have its own zip code. We found lounge chairs to sleep/read in for a couple of hours until the next flight. For this trip, I am re-reading the Autobiography of Benjamin Franklin - an innovator and diplomat who spoke and wrote about individual freedom, equality, and political autonomy his entire life. Seems fitting considering the circumstances. After a two or so hour plane ride from Munich to Kiev, we find ourselves in a bare bones but clean airport for the second layover of our travel. The Kiev airport has a colorful piano available to the public for playing (which reminds me of the Sing for Hope pianos in NYC). 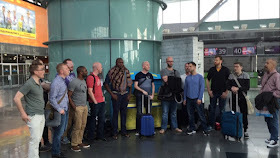 Naturally our first thought was, “if Ukraine encourages public performance, we came to the right place.” So we had our first pop-up performance right there in the airport. Our final destination today is Lviv - one of the most beautiful cities in Eastern Europe. When we finally get in around 10pm tonight, we will have a cultural and security briefing with the US Embassy. Speaking of security - what is unique about this tour for GMCW is that we are doing very little public promotion ahead of time. This is a stark contract from Cuba, for which we hired a publicist in the U.S. and were on the radio every other day leading up to the tour. Additionally, for this tour we are highlighting the name Potomac Fever more than Gay Men’s Chorus. In recent months and years there has been violence in Ukraine against LGBTQ people during public event and rallies, so this nuanced messaging is understandably for our safety. You’ll even notice that the publishing of this blog, including any concert location info, won't occur until after events have taken place. In a way, it harkens back to the early days of GMCW when we sometimes used the name Federal City Performing Arts Association in an attempt to shield supporters and singers from unnecessary questioning and harassment in the early 80s. Returning to this approach is strange considering the post-marriage equality experience we enjoy back home. But it is important to first meet people where they are if we want to establish any kind of trust or connection. It also underscores the need for this type of diplomacy at home in places where discrimination is still alive and well. That’s why GMCW will be traveling to North Carolina this summer, as another extension of our Beyond the Beltway program. Nice photo! For those who have never was at Ukraine, I can say you should come and see what a beautiful place it is? I know a company http://touristclub.kiev.ua/ which can help to orginize a tour. Chase Maggiano is most at home at the intersection of art and social justice. Rarely satisfied with the status quo, he finds opportunities for innovation at every step of his personal and professional life. Chase is interested in finding connections between today's audience and artists and institutions that didn't previously exist. Though starting his career in the tech industry, Chase’s arts experience includes serving as Executive Director for two of the nation’s leading choruses – the Gay Men’s Chorus of Washington, DC and the Grammy-winning Washington Chorus – where he led headline-making gay rights concert tours of Cuba and Ukraine, created youth chorus initiatives for underserved communities, and brought both organizations into the national social justice conversation.